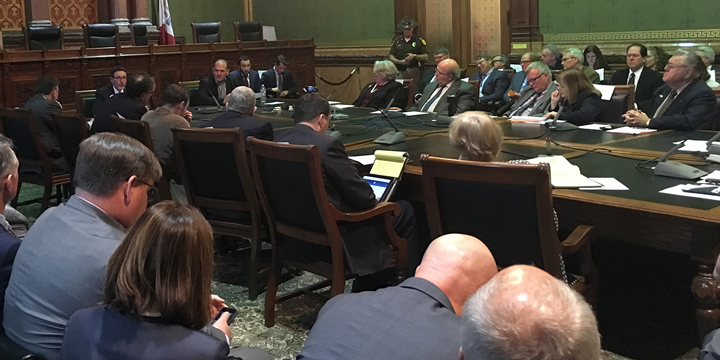 During a 90-minute Iowa House Ways and Means Committee public hearing on the evening of Monday, April 9 in Des Moines, Joe Hearn (shown at left in photo below) and two other credit union representatives were among the 30 speakers who provided perspective on Gov. Kim Reynolds’ proposed tax overhaul. Joining Hearn in the packed Capitol Hill committee room were Cedar Falls (Iowa) Community Credit Union CEO Helen Pearce and CUNA Mutual Group (Waverly, Iowa) representative Joe Luedke. Several community bankers also testified in support of increasing credit union taxes. "My name is Joe Hearn and I am president of Dupaco Community Credit Union, based in Dubuque, Iowa. It is my honor to speak on behalf of the one-point-one million Iowa credit union members, who are owners of their financial cooperatives. Thank you to Governor Reynolds and the Iowa House for designing tax reform that aligns with what credit unions do—help Iowans keep MORE of their hard-earned money. As the legislature considers tax reform -- and a self-serving banker push to cut their own taxes while raising taxes on Iowa credit union members, please bear in mind that credit unions DO pay taxes. Iowa credit unions pay property, sales and payroll taxes—PLUS a moneys and credits tax on reserves which banks DON’T pay. Credit unions are taxed DIFFERENTLY than banks because credit unions ARE DIFFERENT: Different purpose. Different structure. This difference was NOT recognized the Senate tax bill which proposed a thirty-five percent tax increase on Dupaco’s 105,000 member owners. Banks exist to maximize profits for stockholders. No matter the size, credit unions exist to provide access to affordable credit, encourage habits of thrift, and provide opportunity for members to use and control their own money on a DEMOCRATIC basis in order to IMPROVE their economic and social condition. You can find this definition in the Iowa code. Bank customers have NO control. Credit unions members have an EQUAL vote in their cooperative, no matter how much money each member has in the credit union. Iowa credit unions return more than one hundred million dollars annually to members through better rates and fewer fees compared to what they would have paid for similar services at a bank. During the past two years, Dupaco members also earned an additional six million dollars in patronage dividends. We’ll do it again this year. While banks cherry-pick profitable commercial loans and borrowers with pristine credit scores, credit unions are CONSUMER focused. Forty percent of Iowa credit union loans are made to members with BELOW AVERAGE credit scores. Banks have ninety percent market share in Iowa. They’ve enjoyed six years of record profits. Things seem to be working. Instead of targeting credit unions, Iowa banks should focus their concerns on the BIG NATIONAL BANKS, which are growing rapidly and control ONE QUARTER of the deposits in Iowa. Credit unions provide an important Iowa-based alternative to these out-of-state mega banks, as well as the growing number of branchless Internet banks. If credit union taxes are increased, the state of Iowa could see LESS tax revenue because credit unions could convert to a federal charter. The bottom line is credit unions are living our mandate to serve and lift Iowans. Please OPPOSE any tax increase on one-point-one million Iowa credit union members."